For every filmmaker (I would assume) there is a certain level of pride and identity wrapped up in what one chooses to call their production company. This company is either quite literally a business or simply a badge or brand that a filmmaker puts on his or her work to represent themselves and their body of work (usually both). From Kevin Smith's View Askew to Tarantino's A Band Apart there's something immediately defining in seeing these credits on the screen. So after considering this I thought it was about time that I addressed this question myself. 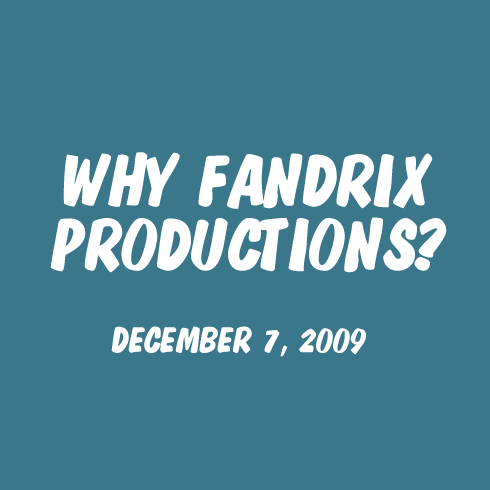 What's the story behind fandrix productions. Why fandrix? And of course, the easy answer is that my name is Luke Fandrich and it doesn't take a scientist to recognize the connection between Fandrich and Fandrix. True, this is the inspiration for the name. The meat of the story is that I was 12 when I picked this name though. I was thinking about a production company name simply as a mark of ownership on the videos I was sharing with family and friends. This is Fandrich's video - or as it became, Fandrix. As years passed and I reached my late teens I began to think more seriously about the name and what it meant to me. The more time rolled on, and as I found myself in film school, it became clear that I was locked in. 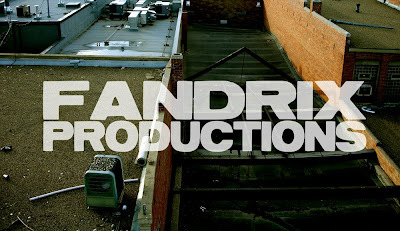 There was no good reason to change my name, if simply for the reason that from the very first short amateur video I ever made up until then, you could see Fandrix Productions or fandrix on it. Nostalgia and branding have made it so much more interesting, especially since over a decade has past since I started using fandrix. A stylized and hand drawn image of a TV with rabbit ears was my first logo - and it's still kicking around. I occasionally use it on my posters these days. I now have an actual old TV with rabbit ears that I use as part of my logo, or I simply use an image of the rooftop that I've incorporated into Editing Luke branding over the years. The fact that this production nickname has acquired a history of its own is reason enough to continue nurturing it. 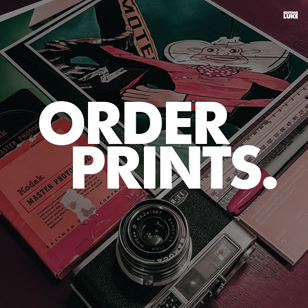 While part of the name, logo, and branding is about playing around and creating an experience, there is also a lot to be said about making your work easily recognizable. My goal has never been about personal fame - but if people can recognize the name on the work and have that as a clue to who I am, that's ideal. I'd much rather have the John Hughes type of fame - you recognize the name and the work, but the average viewer probably couldn't pick him out of a line-up. So, why fandrix? At this point it's because the name links me directly to my changing work from childhood to adulthood, it's a unique variation on my name that I've been able to popularize as representing only me, and I've been able to see myself grow and evolve with a name and logo that is capable of growing and evolving too. It's a time capsule of sorts, that's just too valuable to let go of. And then again, why not?